Sure, your modern e-book reader can do a lot of things — but can it do this? The dos-à-dos format dates back at least to the 16th century, and became quite popular in England in the first half of the 17th century. Two books frequently bound in this form were the New Testament and Psalter, presumably because both were needed during church services. The outer boards of dos-à-dos bindings were usually embroidered or decorated — sometimes with leather and gold. So why would anyone go through all this trouble to create this type of binding? Dos-à-dos books would typically contain complementary religious books, such as the Bible’s Old and New Testament or a prayerbook and a Psalter so that the reader could easily flip from one to the other. In an age where books were expensive, rare, and difficult to access, having essentially six books in one place could be very useful. “While it may have been difficult to keep track of a particular text’s location, a book you can open in six different ways is quite the display of craftsmanship,” Klakken explains. 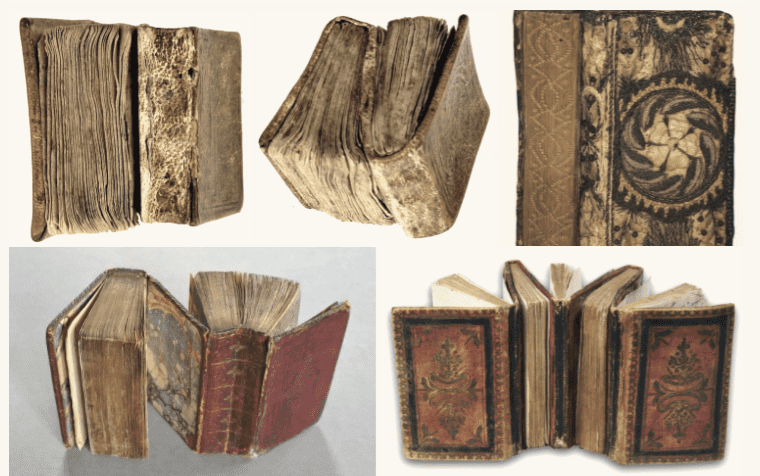 No doubt, such a book would have been as impressive then as it is now — and although the utility of this multi-binding style has been outdated, it has an undeniable beauty to it.